I woke up this morning to find the city covered in a thick fog that seemed to be threatening the first snow of the season. It was lovely and mysterious. Somehow I find the fog soothing, like a comforting blanket that keeps harsh things at bay. So, even though it was only 4:30 AM, I curled up on the couch with my favorite cup of coffee, a fire in the fireplace and some gorgeous yarns from Lion Brand and played with yarn for a while. And this is what I came up with – color, meets texture, meets a whimsical (almost giant) pompom. I was in love immediately! Kevin and I have been talking about taking a trip to Alaska sometime soon. We can’t decide if we’ll take a cruise, if we’ll fly, or if we’ll drive. And we can’t decide what we’ll do…we’re “fly by the seat of your pants” kind of travelers anyway, so that’s fine. But, what we can decide on is that we’re anxious to see the beauty and majesty that the Alaskan wilderness holds. I was daydreaming about the majestic snow-covered mountains, the abundant wildlife, and the myriad colors of nature as I worked on this hat (and few other colorways because I couldn’t stop making them). So, I decided to name this hat after the national park that we’re sure to visit on our travels – The Denali Peaks Hat. The great thing about this hat is that it is a totally unisex winter hat crochet pattern! Simply change up the colors to match the taste of the wearer and you’re in business. It’s shown here in Lion Brand Wool-Ease Thick and Quick in the colors Raspberry and Astroland. The Lite version of the pattern includes instructions for teen, women and men’s sizes of the single brim Denali Peaks Beanie with adjustments for a slouch hat. 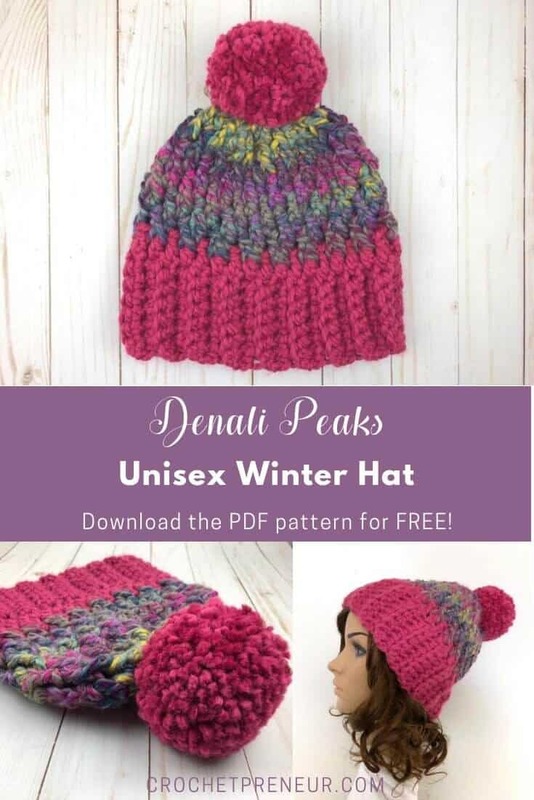 The Premium version of the pattern includes the same instructions but has additional details of how to make a double-brim style and a messy bun style Denali Peaks hat and a small photo tutorial of working the brim. Instructions are given for beanie style hat. Adjustments for the slouchy style and messy bun hat are available in the Premium version of the hat. Instructions given for teen size with adjustments for women’s and men’s in parentheses. Insert the hook, from the front side, behind the post of the stitch below. Folding this band so that the first row and the last row (short sides) meet. Matching stitches, SLST through both layers to stitch the band into a ring. Now, turn the band so that the seam is on the inside. Work the stitches of RND 1 (below) into the end stitches of each vertical brim row (one row equals one stitch). RND 3: CH1, HDC in first ST, FPDC around next ST, *HDC in next ST, FPDC around next ST,* repeat from * to * 15 (16, 17) more times. Join with a SLST to top of beginning HDC. RND 5: CH1, HDC in first ST, FPDC around next ST, *HDC in next ST, FPDC around next ST,* repeat from * to * 15 (16, 17) more times. Join with a SLST to top of beginning HDC. RND 6: Repeat RND 4. RND 7: Repeat RND 5. RND 8: Repeat RND 4. Finish off leaving a long tail. Stitch the top closed. Add a handmade or faux fur pompom as desired. I know you’re going to love making the Denali Peaks Hat and I so look forward to seeing your finished product! What a lovely texture and colour combo. Cosy! Thanks for the free pattern.